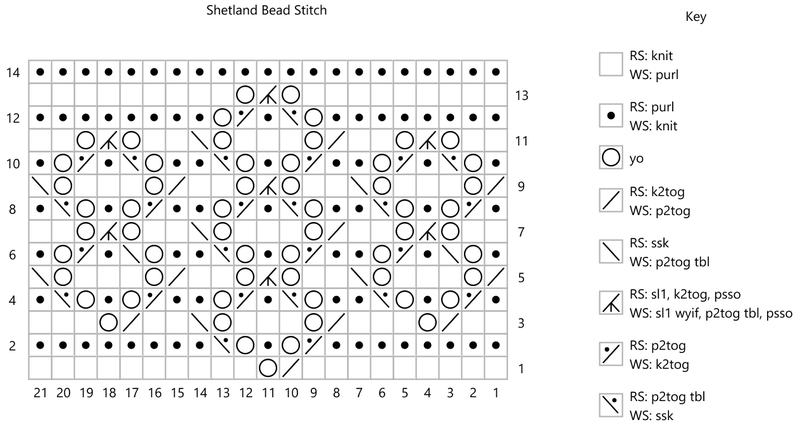 A common question when creating charts for complex lace patterns is what to do about the Wrong Side rows. 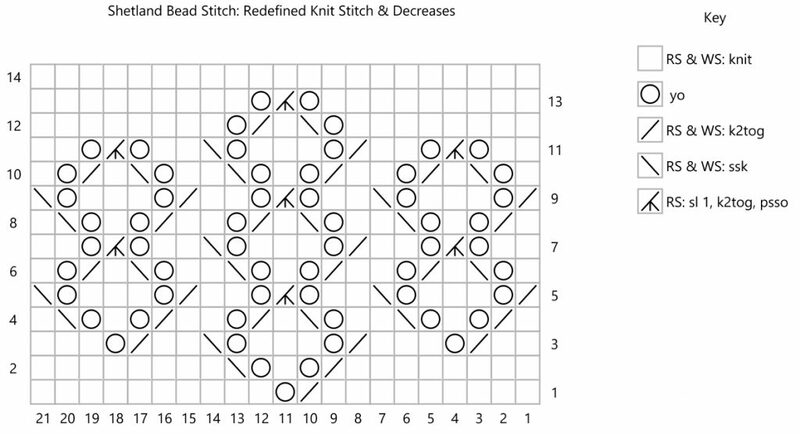 This gets particularly pressing if the chart is worked mostly in garter stitch, as you’re working the same stitches on both sides… so is there a way to simplify the charts to use the same symbol on both sides? This is reasonably straightforward and easy to read. The challenge comes when the charts get larger, as they get busy. 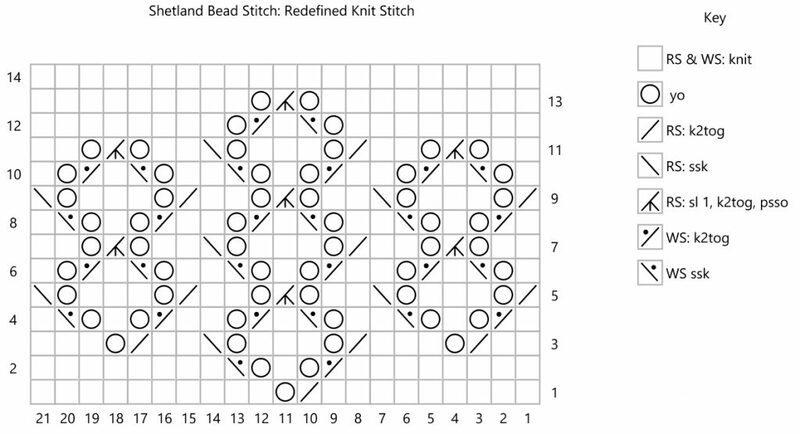 You can still read this, easily enough, but the purl dots are distracting. 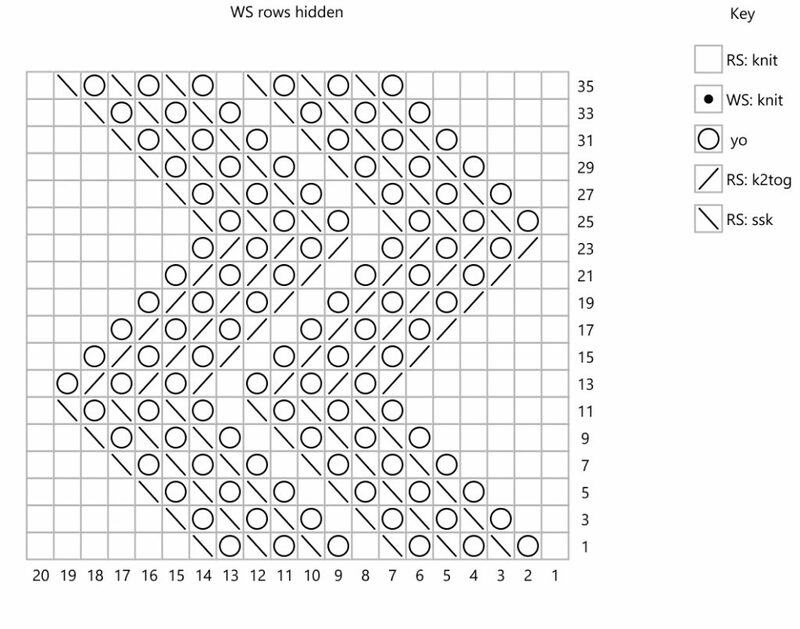 An easy solution, if the WS rows are all worked in the same manner, is to Hide the WS rows. This option is available in the Chart Properties dialog box. By the way: I chose to edit the legend, for ease of reading. 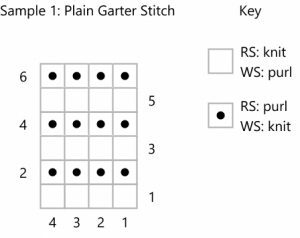 If a particular stitch is never worked on the WS, I simply remove the WS definitions. If you’re going to do this, make sure that you include a note somewhere about what to do on the WS rows. Once they’re hidden, the knitter has no idea if they’re to be knit or purled. 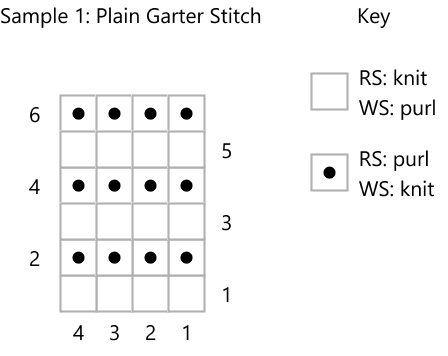 I would put a note in the pattern right beside where the chart appears. 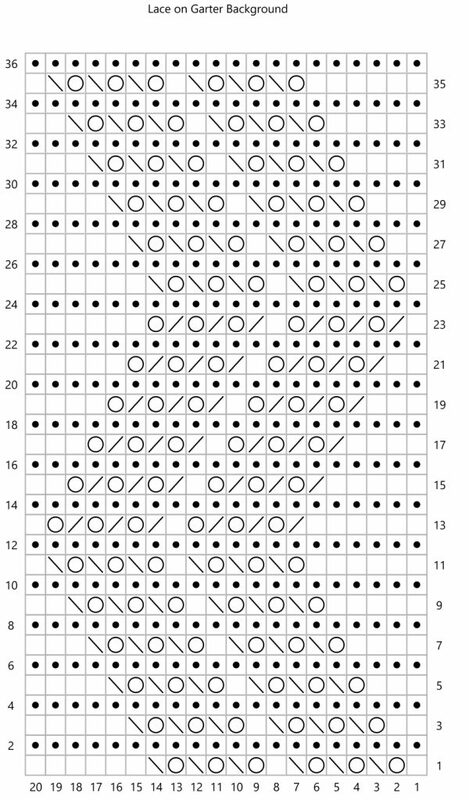 But if the chart has patterning on both sides, things get a little bit more complicated. You can’t hide the WS on this one, as it’s patterned. These types of heavily patterned WS rows can get pretty challenging to read. For one, they’re busy. 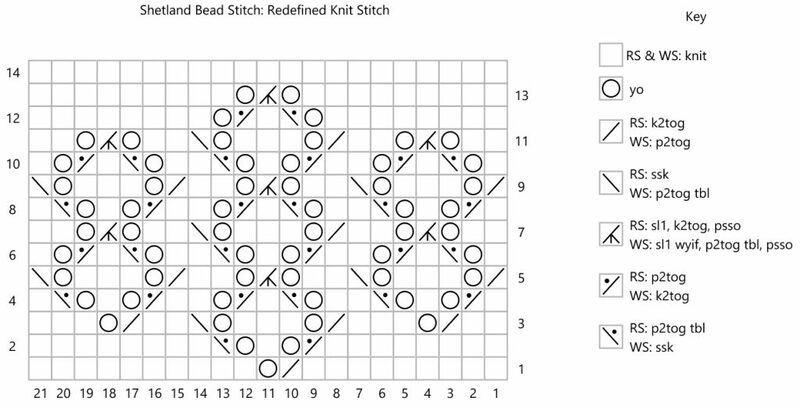 One solution is to change the use of the “knit” symbol. That is, you could create a new symbol that’s a blank square and define it as knit on both sides. If you chose to do this, again, make it very very clear in your pattern that this is what you’ve done. The other reason these types of garter-background lace charts are challenging is to do with the decreases… two-sided lace on a garter stitch background uses knit decreases on both sides. And knit decreases on the WS show as purl decreases on the RS, necessitating the use of RS-facing purl decreases. Which means that you’ve actually got two symbols for the same decreases. K2tog has a RS version of the symbol and a WS version of the symbol. Does it work? Absolutely. Is it easy to follow? That’s an interesting question: on one level, it’s very straightforward: each symbol has one meaning. For a less-experienced chart reader, this is probably the best option. The chart above goes against all standards and expectations. Does it mean you shouldn’t do it? No, but consider the cost and benefits. It comes down to this, in essence: are you able to make your ‘new’ system and symbols easy enough to understand that it makes the effort to learn it worthwhile?